I recently went on a week-long trip to the US, during which I heard a lot about Chromeo. Their album "Fancy Footwork" is now a permanent feature on my iPod. The duo (P-Thugg and Dave 1 - it's all about those crazy names in this sort of outfit), released their debut album "She's In Control" three years ago, and the follow up is nothing short of brilliance. With singles "Tenrderoni" and "Bonafide Lovin" being particular highlights, the album as a whole is one of those you can throw on when you're in the worst mood ever, and it's cheeky riffs and electrofunk style simply cheer you up. Anyone that's a fan of "proper" 80's music should check this out! 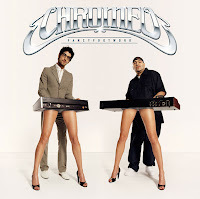 Buy Chromeo's music from iTunes here.